Step-14. Modeling the car door. 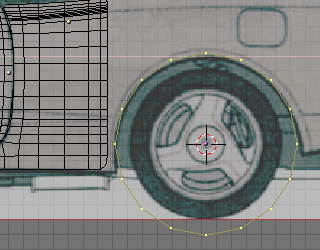 Go to side viewport and select the tyre_cover mesh and get into edit mode. Select the vertices which are aligned towards the door, again duplicate and separate them. Image22. Get out of edit mode and go to the top viewport. 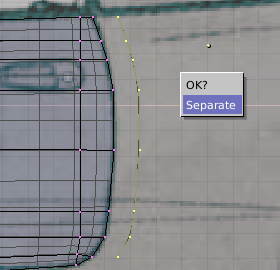 Select the mesh wire we separated for door press ‘TAB’ and start extruding it towards the rear of the car following the door image in the viewport background. Image23. The door can be completed without much difficulty so we proceed to next part. Image22: Separation of vertices to start modeling door mesh. Image23: Top view of the door mesh extrusion. 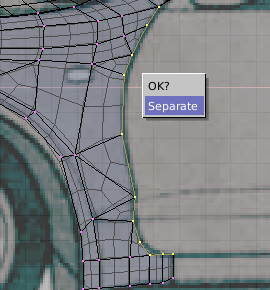 Again get into side viewport and select the door mesh and get a mesh wire from it as seen in Image24. Get into top viewport and watch the back side carefully you will notice a distinct curve just near the back windowpane that starts from the door and moves to back (Watch highlighted portion in Image25b). 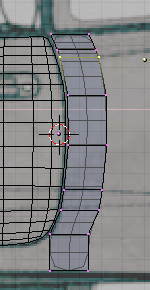 To get that curve first extrude the mesh once Image25a and then subdividing the upper part as seen in Image25b (near selected vertices) to get four vertices near to each other. The four vertices at close distance will make sharper curve even in the SubSurf mode thus reflecting the detail of the curve in the mesh. To do that choose upper two vertices (for simplicity we will call them vert1) from the recently divided part and bring them closer and repeat that procedure for the other two vertices also.. (for simplicity we will call them vert2). The vertices group vert1 and vert2 can be seen in Image25c. Image25c: The vertices grouped are grouped vert1 will follow the part closer to the body (window) while vert2 will follow the extended part outwards (tyre). Now as you will see in the top viewport that the one side of the curve is extended outwards while other remain at the same line as was the door or near to the window pane. Now whenever the contour of the curve will have to be traced only the vert2 all the vertices below it will be moved. Leave the vert1 and above vertices to follow the wind glass edge only. Do not forget to follow each step in all the viewports for tweaking/correction. Image26: Insert circle for tyre cut out portion. Image28: Side view After few extrusions and face building. Step-17. 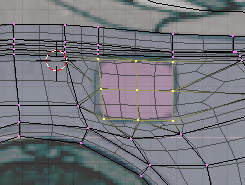 Before proceeding, adjust the mesh in by check and modifying the mesh in other viewports see Image29a. To make the fuel door get into side viewport and adjust the vertices around the fuel door to trace the rectangular shape of the door. Select all four vertices for the fuel door and subdivide once, remove the vertices in the middle of the selected rectangle. See Image29b. Image29a: Top view of the back mesh, watch the contours created by vert1 and vert2. Image29b. The fuel lid selection. 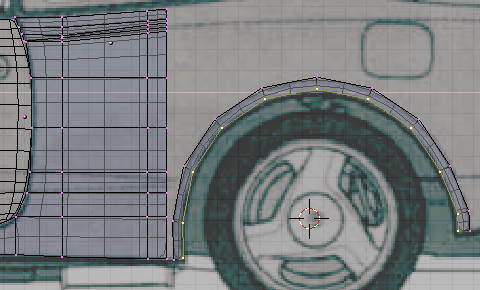 You can also use the vertices of the fuel door to make the door itself by first duplicating them then separating them. After that edit it to get the required shape of the door. © 2004-2015 Gaurav Nawani | All Rights Reserved.